It seems like only yesterday that HD TV was introduced; actually, High Definition TV sets first went on sale in the U.S. in 1998. Today, “1080p” is a familiar TV standard. It means a picture that contains 1920×1080 or 2,073,600 pixels per frame in a 16:9 aspect ratio. Now brace yourself for Ultra-High Definition TV, also known as UHD or “4K.” It’s tempting to assume that means “4 million pixels,” but in fact the UHD standard is 3840x2160 or 8,294,400 pixels per frame… four times the pixels of HD TV. That’s four times better, right? Not necessarily, according to tests conducted by Consumer Reports on several HD and 4K TV sets. The test compared identical content displayed simultaneously and side-by-side on Sony sets of comparable quality. 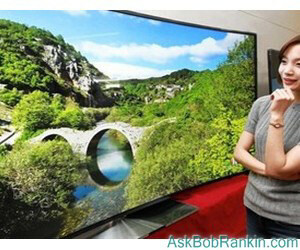 So if counting the pores on the your favorite actor's face or reading the fine print at the end of the car commercials makes a big difference in your TV viewing experience, by all means go buy a 4K TV today! 4K TVs will be boons for mass storage device makers and banes for Internet Service Providers because four times as many bits will be needed to transmit and store a given video. But 4K content is proliferating online. YouTube has been streaming 4K content since 2010! Since June, 2014, Netflix has been streaming 4K versions of House of Cards; Breaking Bad; Ghostbusters; Crouching Tiger, Hidden Dragon; and some nature movies. Amazon Movies launched a 4K service in December. Digital Trends Guide to 4K Content provides details on these and several other sources. Many movies and TV series are now available on 4K Blu-Ray discs, too. Keep in mind that you'll need a high-speed Internet connection to stream 4K shows or movies. If your incoming speed is less than 15Mb/sec, you might experience hiccups or lower resolution. And don't hold your breath waiting for 4K content on live broadcast TV. That's at least a year away (and probably longer) from happening. Most recent comments on "The 411 on 4K TV"
I saw a TV set at Costco in Canada for $626, that is $488 US at the current exchange. I could not analyse the details of the picture, but it seemed more fluid and less jerky than other big HD at near $2000? I have yet to find a TV that will match my HP HDX 18 inch laptop screen which I bought 7 years ago. I just love to be looking at the picture's details, just as much as the story itself. It must be quite beautiful to use a 4K TV with a 4K video camera! A great article, but useless for me. I actually have a TV but alas, no antenna or internet connection. It sits and doesn't catch too much dust. I may have to unbox that Blu-Ray player and plug both in so I can watch the Mel Brooks movies I bot from the South of the Border retailer. I bot the set, 9 of them, knowing that I didn't have a Blu-Ray player. Talk about marketing skills. Pants - possibly due to 2 pant legs ?? So there is a pair of pant legs which becomes a "pair of pants" Not that you can normally get pants with just a single pant. Hmmm would you call that a pant - as in "keep your pant on" ? My beef with this is that I live in a rural area that only got 1.5Mbps DSL a few years ago and that is not as reliable as it should be. I can rarely watch Netflix after about 8pm The time varies by +/- an hour but is pretty much a daily occurrence. Upload speeds of lower than 100kbps down to none at all. I have to switch off the wireless on my iPhone to play Words with Friends! The lack of difference between 4K monitors and current monitors is, mainly, due to the fact that most content is not primed or created for 4K. When those come about, the content WILL be Ultra-High Def. Great article! I agree with all your observations. I recently bought a 50'Samsung 4k UHD. I still have the 50'Samsung Plasma. I have watched the Nexflix Marco & House of Cards. I don't see much difference. Even my adult kids said they prefer my Samsung Plasma. The 4K nature videos on Netflix appear to be a little better, but not much. It's a great Smart TV. I don't regret buying the 4K. I may give it to my son and by another on later. There are two things to consider before buying an ultra HD TV. One is your age. All eyes deteriorate with increasing age. I doubt that at 76 I would see any difference between UHD and plain HD. Two is what makes for a good movie watching experience. I think that an interesting plot, a believable story and great acting are what really matters. Rubbish in UHD is still rubbish. There is also a third. Familiarity! When you got your first wide screen TV the word wow often came to your lips. Does it still? Familiarity breeds indifference. If you don't like the thought of a PAIR of pants, simply cut one of the pant legs off. For that, of course, you'd need a PAIR of scissors. this is 134.4 inches so TV diag = 153.2 inches! or alternatively use 77" diag TV at 5 ft away! I love it. People go out and spend big bucks for a new HUGE TV set, get all excited, bring it home, get it all set up, turn it on, and all they get is the same old stuff.... only bigger. films) and I am only a few days short of your age. One thing to consider is that the 4K TVs are at the top of the line, so if you want the best TV 4K is probably the way to go. Another thing is that these 4K TVs aren't always fully 4K in that they don't do 4:4:4 chroma over HDMI 2.0. When considering a 4K TV it's a good idea to consult a chart to decide if you'll benefit. This will give you an idea. I bought a Samsung 40" 4K HU7000 (US model HU6950) for my computer room as it sits about 4' from my chair and I'm pleased with it. It's on sale here in Canada for $700 so it isn't a big outlay to have a 4K TV.